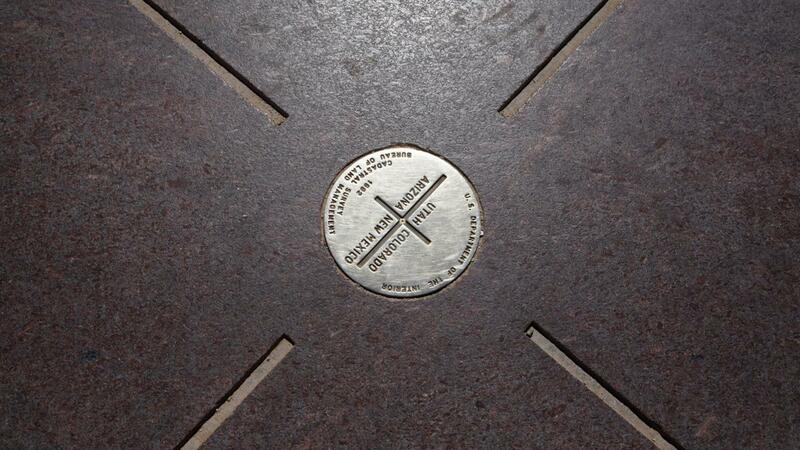 The states at the Four Corners are Colorado, New Mexico, Arizona and Utah. These four states meet at the northeast corner of Arizona, the southwest corner of Colorado, the southeast corner of Utah and the northwest corner of New Mexico. The Four Corners area was part of Mexico until 1848. The United States acquired the region at the end of the Mexican-American War. The Four Corners region marks the only place in the United States where the borders of four states meet. It is located in the Colorado Plateau near reservations governed by the Navajo, Ute, Zuni and Hopi nations. The nearby Four Corners Monument is administered by the Navajo Nation. This monument marker was placed in 1912 and has since been updated. However, the monument's origins date back to 1868. Controversy over the placement of the marker has occurred over the years, including in 1919 and 2009. The largest city in the vicinity of the Four Corners region is Farmington, New Mexico, which is also home to the Four Corners Regional Airport. National parks located near Four Corners include Arches, Mesa Verde and Canyonlands. Other nearby attractions include Monument Valley Navajo Tribal Park, Goosenecks State Park, Lake Powell and Dead Horse Point State Park. What Is a Mojave Viper? Where Are Some Cheap Places to Get Married in the United States?